Happy Wednesday everyone! No trouble with any of the clue words this morning, although BEETLE caused me to pause for a couple of seconds. We’ve seen WIZARD recently so that was probably the easiest of the bunch. With all of the clue words solved, it was full steam ahead to the cartoon! When I read the cartoon sentence, I had a feeling that BYE would be the 3-letter word in the solution. Writing out the letters, BYE was there leaving STANDERS for an instant solve and a quick finish to another great Jumble. Looking at the cartoon, Jeff gave us two great clues to figure out the locomotive’s location. 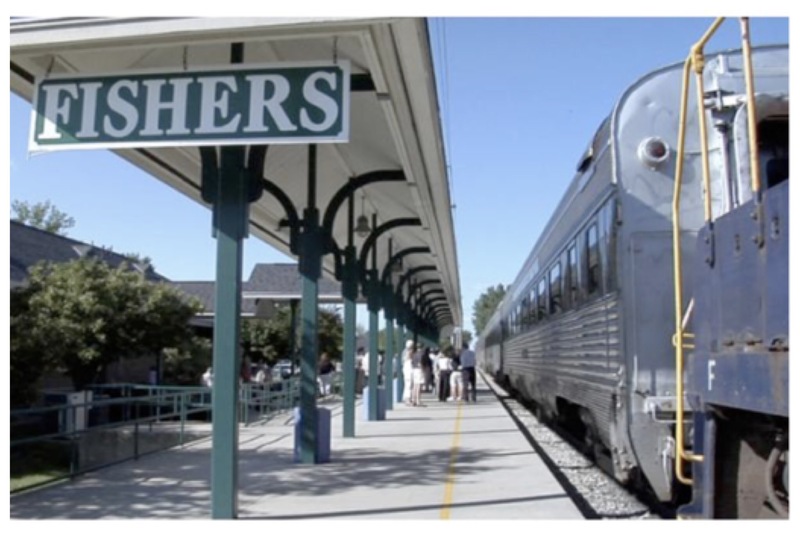 The first was the sign on the train that said “Nickel Plate Road” and the second was the station sign of “Fishers”. Not being a train enthusiast, I had to google both clues together to come up with Fishers, Indiana. Hopefully our friends near that location can give us some insight into it’s history and importance. Enjoy your day and I’ll see you tomorrow! I have heard it said that most people get lost in thought because it’s unfamiliar territory! “MONTY Python”. No relation to PYTHOR. Blondes? I was about to say that it looked like blondes hadn’t been invented yet. My paper must have really bad color registration. LOL…The typo was auto (in) correct Yep, 2 blondes today. In purple…ad nauseam. But what about that baseball cap???? 😀🙋🏻. Would you believe it’s 90 degrees here? At first I blanked on the answer but then saw stand and the rest followed. Mike, I think it’s possible Fishers might refer to Fishers, NY, a hamlet not too far from Rochester. It’s said to have the second oldest railroad building in the US. There’s also a really good breakfast place – Fishers Station. I see JumbleJeff is from Fishers, Indiana, so that must be the one. Caroline–I also thought Fishers might refer to the hamlet you referenced–did not know about the station. Thanks for enlightening a Western New Yorker who lives along the historic Erie Canal and the old Amtrac rails. Hi Earl – I don’t know if there was actually a station at Fishers, NY. The railroad building there was a pumphouse, Good one, Angela! Maybe Harry from Indiana can enlighten us. I also had no problems with the clue words, But had to stop and think about the spelling for beetle. After studying the cartoon and looking at the quotes, I thought I had “a no-writing day.” But the answer eluded me so I had to write the letters out. The answer came almost immediately. Three clue words with double letters seems a little unusual but I am new to this site. Thanks for the geographical background on Fishers and look forward to more info on the history. Harry! You look maaahhhhvelous! WAY too classy for the rest of us here (especially MYSLOB). Whew…Bought a new computer and I could not enter my jumble comments. Finally figured I had to “register” so I used my FB stuff and voila my picture appeared. I do apologize! ….More powerful than a LOCOMOTIVE…. Perfect! 😀🙋🏻. Ha! What a great line! See, that’s why our baseball stuff goes here and not on facebook! Mike, Angela, here’s a link to,a great story about a guy who was at both the recent Reds/Giants 17-inning walkoff, *and* the 16-inning 1-0 Willie Mays walkoff on July 2, 1963. Let me know if the link doesn’t work and I’ll get it to you somehow else. I’m off to shop for a couple hours, cheers! Angela and Lelia – You tell me that “today’s topics are Trains, Indiana, and Food ” and then you post a Dentist joke? But since you gave me the opening I do have a food-related item that I will post later. I was going to apologize for,going off-topic, but then I realized that after reading about okra, chicken livers, gizzards, and Fried Bicycle Tire, I feel I have carte blanche to post just about anything on food! Oh, and I think you guys set a record today for number of posts before 10 AM PDT. Steve, you’re not following in order of post time. The dentist joke was YANKED OUT! It was crossing the INVISALIGN! After that I put in the disclaimer regarding topics. And now Food’s “off the table ” , ( Jeez I’m on a roll..oh, roll, another one)! because you bring up unsavory (!) items. This is a Plethora of Puns Post! And you’re right, the comments this morning were wayyyyyy ahead of SCHEDULE…. ( The Roubd Table Boys will be buying my drinks tonight)!!! LOL. 😅😅 🙋🏻. I would be interested to hear whether any of your Round Table friends are Monty Python fans. (Out here in the sticks, Round Table means you’re going out for bland pizza). Yes, the plethora post was great; I’m in awe. Ask your friend about the pet-conversion sketch, WRT Leila changing “one pig” into PIGEON. I thought I heard that they considered “Owl-Stretching-Time” as a name, but I doubt that’s what you meant -please tell me. The picture is tiny! Maybe if I logged into Facebook I could see it but I hardly ever go there anymore. Mike, now I’m confused. (I told you, it doesn’t take much…that TRAIN of thought thing)! I meant the ‘fishing for a compliment’ post for Harry…Unless I just got the boxes mixed up. .I swear these reply boxes should come color-coded. I got dibs on PURPLE! The posts are coming fast and furious so far this morning…Crowded, like the A TRAIN. . God, you guys have no idea…Talk about ‘Hot..dirty..loud…”! 😀🙋🏻. Thanks Ang………….I promise it has not been photoshopped….Me and all my natural beauty! I have not had that suit on in 10 years! That would be Fishers Indiana. I knew Harry would know. Way back when, Fishers was on the Nickle Plate rail line. Now the city has become an amusement park. No charm, just every chain restaurant and store you can think. But it has great schools and has been a good place to raise my kids. Until it’s time to move (when the kids are out of school), we’ll just keeping chugging along here. Hey I googled Nickel Plate but it said nothing about Indiana. I only know about the Nickel Plate Tavern and their great breaded tenderloins, another Indiana original started in Huntington Indiana. Hmmmmm. The food. Perhaps this is why the suit hasn’t been worn in 10 years?? Just ‘ sayin….. Wise woman, very wise but hey I still have all my teeth and hair! Follow up to Dentist joke…The patient grabbed the dentist’s manhood and said. we aren;t going to hurt each other are we? This is a family friendly blog………….. I have a cardiologist joke, but I want to run it by Lelia first, and won’t post it until #JUMBLEANSWERSAFTERDARK time. Harry, Indiana came later. Here’s the link. It’s lengthy, but interesting. Scroll down to Lake Erie and Western. Kewl….thanks….Now I can dazzle everyone in Hamilton County! Looks like it’s close to the route of the current I-90 but a little bit South. Parentheses and hyphenated! Thought it would be trouble. But stayed right on track and rumbling along this week. No problem with the clue words today. “Bye” appeared right away and standers just fell into place. Thanks for the railroad history lesson, Mike & Jeff. Happy Wednesday everyone. The words were very simple, but with no disrespect intended, the solution was a bit of a stretch. I guess you get used to this guy after a while and you figure out how his mind works. The puns are a large part of the appeal of Jumble. Hi Mike et al, I woke at 6 a.m, sat up too fast, and gave myself a horrible case of vertigo with dizziness, inability to walk, nausea, & cold sweats. It lasted only 6 hours, so here I am. I LOVED the train cartoon; brought back so many memories. We moved to Arizona by train when I was about 15. I remember saying, “When we stepped off that train in Arizona, I felt like I had just been thrown into a furnace!” Then from Arizona, we traveled by train to visit in Arkansas until we bought a car. Then I visited my dad in Houston by train for years. Mike, what do you think of me being such a loyal commenter that I show up still a little dizzy? I rode our indoor scooter in here to my computer. Steve, as I scrolled down the comments I saw that you will run a cardiologist joke past me. Bring it on. I wish a wonderful late afternoon & evening to all. See you tomorrow. Angela: Is this one for magenta? Magenta man pushed ma chair in for me. Groan? Lelia, don’t ever try this again? You have a long way to go? OK for a beginner? Hi Lelia – that sounds like what my wife had all last week. She’s been much better this week, and I hope you are too. I was hesitant to post a heart joke without knowing how Jerry’s tests were doing, afraid of being inappropriate, certainly don’t want to cause any offense or pain. I’m sympathetic to that also because in the past couple of years my wife had two episodes of serious but (fortunately) temporary cardiomyopathy which completely resolved. Joke later if you still want (after all this, probably won’t live up to the buildup, but it *might* make Jerry laugh if I’m lucky). Mike, wow! I think your complimentary comments to me made me well! Thank you for every word! Also, after one more one-hour nap, I am now walking fine. We will get the results of Jerry’s routine testing next Tuesday. What has our hard-working man been doing that has kept him busy lately? Last spring/summer you transformed part of your basement into a wonderful office. Now I am going to guess what you’re up to this spring. First guess, the other half of your basement. Second guess, Trex Deck. Third, you are bottling your first batch of honey while trying not to get stung by the bees. Fourth, you are planting a vegetable garden. Fifth, you are searching yard sales for scrabble tiles. Sixth, none of the above. Sorry, I like to guess. Thanks again for your comments to me, daily blogs, comments to others , etc. How about producing Maple Syrup over the winter? (Yankee stereotype). Cardiologist to patient’s husband: “Your wife has acute angina”. If your precious wife does have even a touch of vertigo, I hope it goes away soon because it brings your life to a screeching halt. The longest I’ve ever had it is 2 days, but our minister had it for a month & could do nothing but lie in bed. It has something to do with something getting out of whack in your ear. I usually get up very slowly to prevent it, but not today. I’m just glad to hear you’re feeling better – that’s all that matters! “Purple haize, at Safeway now. Glad I didn’t see a purple cow! Piss smells funny, but I don’t know why. Just a check-in before I check out. Headline: Penguins implode. I didn’t know they could do that! Cooking – no. Steaming vegetables is about my limit. “What a night” – Frankie Valli? Cheers till tomorrow, over and out. Glad about the Penquins. You misread the Dragnet thing! I understand, but that’s why I was reluctant to post it, and waited for the FCC-declared late night #JUMBLEANSWERSAFTERDARK time. You and Harry were going at it during the Saturday morning kiddie cartoons! Nevertheless, we will all step back from the invisible line. Good morning. Six of one…six of one…I was worried for Lelia.. I really hope she dud the get it. Kiddie cartoons! HA. And, y’day I used INVISALIGN… A tooth pun! LOL. I saw what you did there 🙂 I think Leila got it and Jerry didn’t, but I just want to drop the whole subject right now. * didn’t get it. Fingernails.